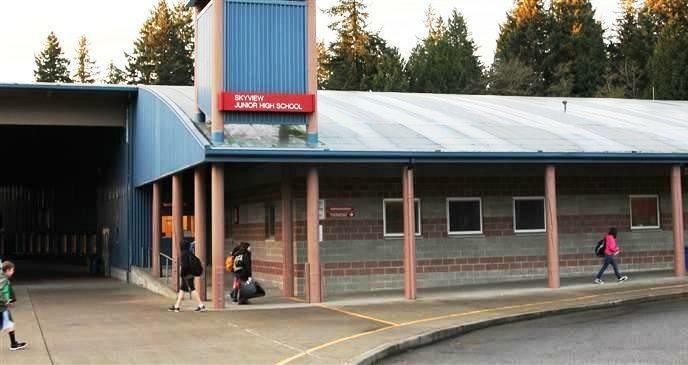 On 16 September 2013, I resumed teaching beginning brass at Skyview Jr. High School (SJHS). Students from three elementary schools come to SJHS for classes from 7:55-8:35 a.m. The three elementary schools are Canyon Creek, Fernwood, and Crystal Springs. A few students from other nearby schools also attend. First-year band students come on Tuesday and Wednesday mornings for sectional classes, and second-year band students come on Mondays and Wednesdays. Then on Fridays, I conduct a class for the whole second-year band. Mr. Shawn McGinn has been Director of Instrumental Music at SJHS since 1999, and has taught over 10,000 students! His students feed into Bothell High School. There are numerous other posts, with photos, on this blog about the many band concerts that have been held at Skyview and at the Northshore Performing Arts Center in Bothell since I’ve been been teaching trumpet and other brass instruments here. This entry was posted on May 26, 2014 at 5:19 am	and is filed under Skyview Junior High. Tagged: band, brass, Canyon Creek, Crystal Springs, elementary, Fernwood, music, Northshore Performing Arts Center, Shawn McGinn, Skyview Jr. High, trumpet. You can follow any responses to this entry through the RSS 2.0 feed. You can leave a response, or trackback from your own site.